Kitchen Remodeling in Benton, ME | Stevens Siding & Window Co.
40 Benton Plaza Benton, ME 04901 | (207) 453-8346 – CALL TODAY! (207) 453-8346 – CALL TODAY! Stevens Siding & Window Co. is the place to call for experienced kitchen remodeling services. With over 30 years of experience in the remodeling business, our team of experts can create the kitchen of your dreams. We discuss your kitchen needs with you, and then we will give you a no-obligation free estimate on the work. Whether you are looking for more space, new cabinets and countertops, or a complete redesign, we can do it all. Give us a call today to set up a meeting with a member of our team, or stop by and visit our Benton, ME, showroom: (207) 453-8346. From Cabinets to Flooring, We Do It All! Our team focuses on customer satisfaction, and we take pride in being able to fulfill nearly every remodeling wish our customers have. Want to add a new window over your sink so you can see your kids playing in the backyard? Sure thing! Looking to expand your kitchen and add an island for more prep space and storage? Yeah, we can do that, too. Whatever you want for your kitchen, from cabinets to flooring, to fixtures and more, we can do it all! When you get your kitchen remodeled, you want a remodeling contractor who will pay attention to the little details. 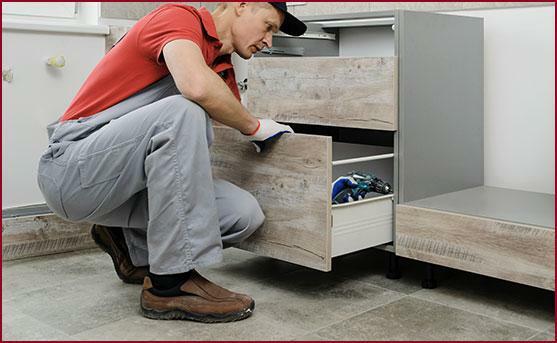 From ensuring your cabinets have the correct handles and knobs, to making sure your new countertops are the correct shade that you love, to making sure the hardware on your cabinets is installed tightly and correctly, and checking that your new fixtures are functioning properly, our team looks out for you. Contact us today to discuss your kitchen needs with our team, and receive a no-obligation, free estimate: (207) 453-8346.